Seems it’s seldom these days that I post any music just for music’s sake, just to celebrate the greatness of a song, rather than to commemorate some occasion or happening. I’ve already quite thoroughly expounded upon the life and time of Milton Brown—the Father of Western Swing—so I feel I needn’t go into much more detail about that here, you may go read it on that page if you so desire. But there’s still plenty more to say about the many records Brown made in his short two year recording career, and goodness knows there’s so much more to hear. So herein is one of my own favorites of those many, I hope you’ll enjoy it as well, and I also hope to be able to offer some anecdotes and shed some light that may perhaps not have been shed otherwise. Though his recording career only spanned from 1934 to 1936 (excluding the Fort Worth Doughboys session in ’32), in four sessions, two for Bluebird and two for Decca, spread over a week’s worth of days, Milton Brown managed to cut a total of one-hundred-and-three sides. Decca 5201 comes from the first and second days of Brown’s last session, his second for Decca. It was recorded at the Roosevelt Hotel in New Orleans, Louisiana on March 3rd and 4th, 1936. The Musical Brownies at this point in time included Milton Brown singing and leading Cecil Brower and Cliff Bruner—the latter a new addition to the band for this session—on fiddles, Derwood Brown on guitar, Ocie Stockard on banjo, Bob Dunn on steel guitar, Wanna Coffman on string bass, “Papa” Fred Calhoun on piano. 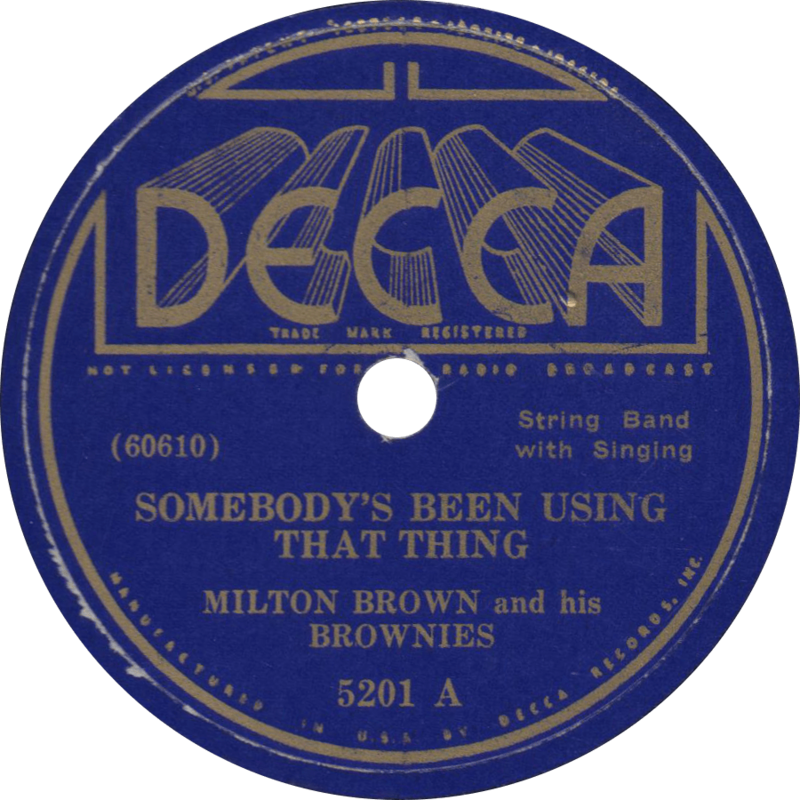 Firstly, the Musical Brownies get hotter than anything on “Somebody’s Been Using that Thing”, one of several tunes Milton lifted from the Hokum Boys’ repertoire, some others being “Easy Ridin’ Papa” and “Nancy Jane”—though it was written and originally recorded by mandolinist Al Miller in 1929. To set the record straight (pun intended), one “Greaseman” has evidently propagated preposterous misinformation that the lyric in this song is “Georgia boy, somebody’s been using that thing,” while it is in fact “sure as you’re born, somebody’s been using that thing,” albeit slurred to sound like “sho’s yo’ bo’n.” This one is a serious contender against “Garbage Man Blues” to win the title of my personal favorite Milton Brown song. Somebody’s Been Using That Thing, recorded March 3, 1936 by Milton Brown and his Brownies. On the “B” side, Milton sings a respectable pop vocal on Sammy Fain, Irving Kahal, and Pierre Norman’s jazz standard “When I Take My Sugar to Tea”. Listening to this tune, one wonders if Brown was familiar with the work of the Boswell Sisters. 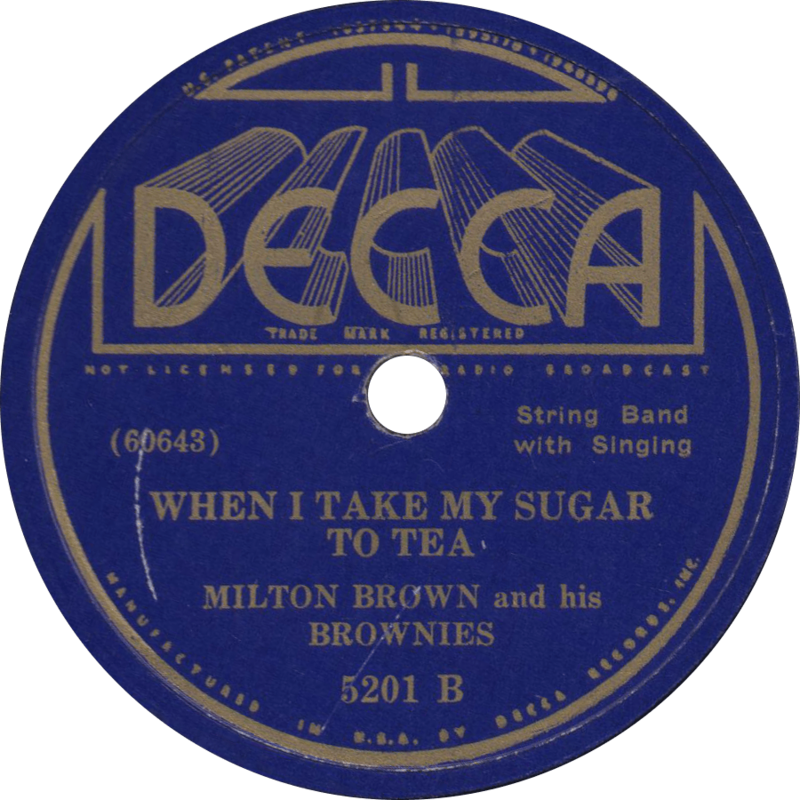 When I Take My Sugar to Tea, recorded March 4, 1936 by Milton Brown and his Brownies. Look out friends, here’s Leon! Take it away, boys, take it away! The last thing we heard from ol’ Bob Wills was his famous “New San Antonio Rose” of 1940. Now, let’s get a little hotter with an early side by the King of Western Swing (and if you ask me, that Spade Cooley never deserved the title). 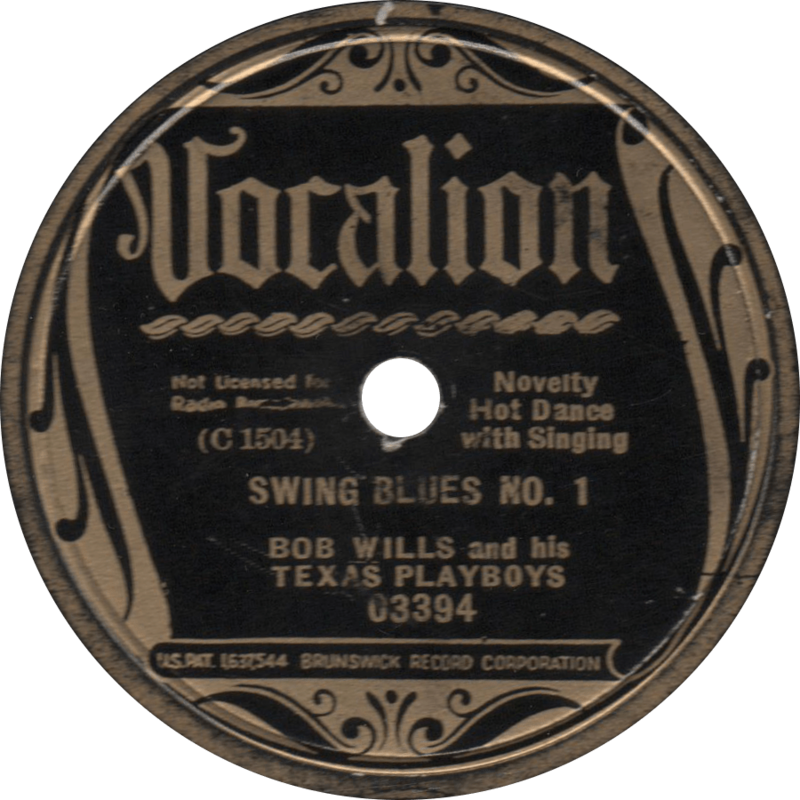 Following a pair of unissued recordings with his “Wills Fiddle Band” for Vocalion, and a stretch with the Light Crust Doughboys of Burrus Mill, Bob Wills first organized his Texas Playboys in Waco, Texas in 1933. The next year, they relocated to Oklahoma, where they began a radio program broadcast from Cain’s Ballroom in Tulsa. In September of 1935, Will’s Texas Playboys recorded for the first time in a series of sessions held in Dallas that included “Osage Stomp”, I Ain’t Got Nobody”, and “I’m Sittin’ On Top of the World”, as well as four sides with only Wills and guitarist Sleepy Jackon, highlighting his own merits as a fiddler. They followed up the next September in Chicago, cutting such classics as “Trouble in Mind” and the famous “Steel Guitar Rag”. Wills built his band around such talents as steel guitarist Leon McAuliffe and singer Tommy Duncan, all of whom he helped make famous with his “hollers,” announcing their solo and other quips. Over the years, Wills developed his Texas Playboys from a fairly small string band into a full-fledged swing orchestra that drew larger crowds than Benny Goodman and both Dorsey brothers’ orchestras. In the 1940s, the Texas Playboys toured across the states, and eventually settled in California. Throughout that decade, they made a series of film appearances, and their popularity soared, to the point that they were a national sensation. During the War, Wills made a number of patriotic records such as “Smoke on the Water” and “Stars and Stripes on Iwo Jima”. The popularity of the Texas Playboys continued through the postwar era, and into the early 1950s, when they recorded Wills’ famous “Faded Love”. As 1950 turned to 1955 however, musical trends shifted, and their popularity began to wane. Nonetheless, the Texas Playboys continued to perform until 1965. Wills continued his solo career until a stroke in 1969. Bob Wills and many of the former Texas Playboys were reunited in 1973 at a tribute concert with Merle Haggard. After the first day of that concert Wills suffered a stroke that led to his death two years later, in 1975. Vocalion 03394 was recorded in the Furniture Mart Building at 666 Lake Shore Drive in Chicago on Tuesday, September 29 and Wednesday the 30 of 1936, just over a year after their first sessions in Dallas, and their first return to the studio since. The Texas Playboys are made up of Bob Wills, Jesse Ashlock, and Sleepy Johnson—who doubles on guitar—on fiddles, Everett Stover on trumpet, Ray DeGeer on clarinet and saxophone, Robert “Zeb” McNally on alto sax, Leon McAuliffe on steel guitar, Johnnie Lee Wills on tenor banjo, Herman Arnspiger on guitar, Al Stricklin on piano, Joe Ferguson on string bass, and William “Smokey” Dacus on drums. I don’t know why it is, but these “scroll” label Vocalions tend to be some of the most enticing records out there! Lots o’ great stuff to be found on ’em. 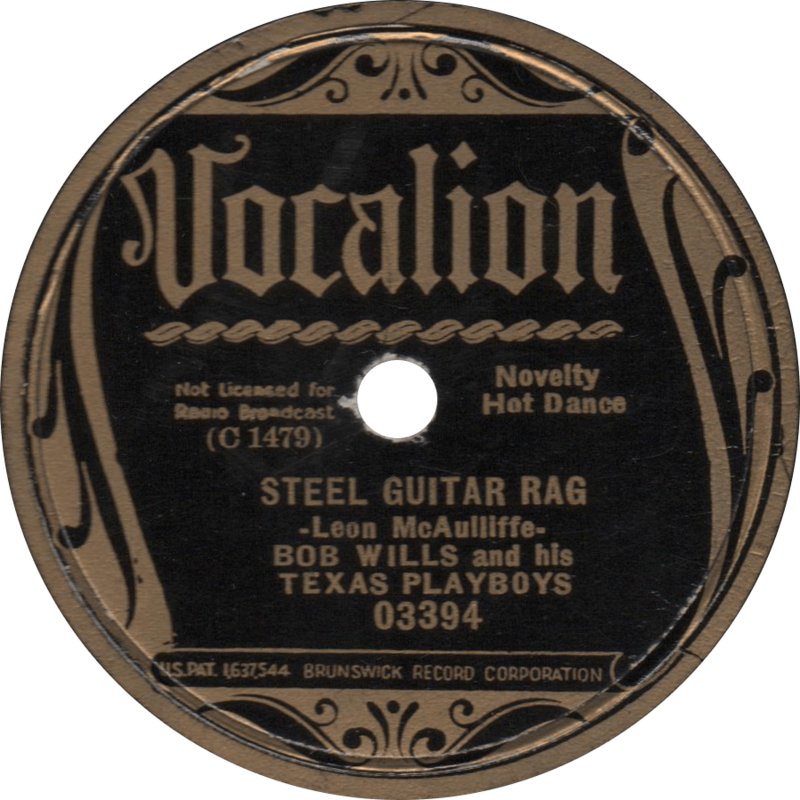 Leon McAulliffe’s famous “Steel Guitar Rag” was derived from blues guitarist Sylvester Weaver’s “Guitar Rag” of the previous decade, which he recorded first in 1923, and again in 1927. Wills’ Texas Playboys heat up on this side a helluva lot more than Weaver ever did, with a healthy dose of hot jazz injected in it. Becoming one of the Texas Playboys’ best-sellers, the success of “Steel Guitar Rag” made “take it away, Leon” a household phrase in the Depression era South. That saxophone solo at around a minute-and-a-half in is just sublime! Steel Guitar Rag, recorded September 29, 1936 by Bob Wills and his Texas Playboys. Next, cut the following day, the Texas Playboys get low-down with a vocal duet between Wills and Tommy Duncan on “Swing Blues No. 1” (yes, there was a “Swing Blues No. 2”, too). Swing Blues No. 1, recorded September 30, 1936 by Bob Wills and his Texas Playboys. In their heyday, Don Albert’s orchestra was called “America’s Greatest Swing Band”, a title which they perhaps deserved. Today, their renown, however great it may have been in the 1930s, has faded. Don Albert was born Albert Anité Dominique in New Orleans on August 5, 1908. He was the nephew of trumpeter Natty Dominique, and also reportedly a relative of Barney Bigard. Albert took up the trumpet to join in on the Crescent City’s famous brass bands, and was instructed on the instrument by Milford Piron, brother of the renowned bandleader Armand J. Piron. Sometime in the middle part of the 1920s, Albert relocated to Dallas, where he joined Alphonso Trent’s orchestra at the Adolphus Hotel (later the Gunter Hotel), with whom he toured across the southwestern United States. After departing from Trent, Albert joined Troy Floyd’s orchestra of the Plaza Hotel in San Antonio, with whom he remained until forming his own band in 1929. Initially calling themselves “Don Albert and his Ten Pals”, Albert’s new band played the Texas State Fair in 1929, and supplanted Floyd’s band at the Shadowland speakeasy in San Antonio. In the 1930s, Albert’s orchestra toured across twenty-four of these United States, and billed themselves as “America’s Greatest Swing Band”, but only recorded eight titles in one San Antonio session for the American Record Corporation. In the 1940s, Albert opened an integrated club, Don’s Keyhole, in San Antonio, which closed in 1948, at which point he returned to New Orleans for a short period. Once back in San Antonio, Albert opened another club, and following harassment from authorities, filed a restraining order against the city, taking his case all the way to the Texas Supreme Court and winning. Aside from his musical work, Albert was also employed as a civil servant at Fort Sam Houston from the late forties or early fifties until retiring in 1974. Don Albert retired from performance in the late 1950s, but continued to play sporadically for the rest of his life. He died in San Antonio on March 4, 1980. Vocalion 3401 was recorded on November 18, 1936 in San Antonio, Texas. Don Albert directing Billy Douglas, Alvin Alcorn, and Hiram Harding on trumpets, James “Geechy” Robinson and Frank Jacquet on trombones, Herbert Hall on clarinet, alto sax, and baritone sax, Gus Patterson and Harold “Dink” Taylor on alto sax, Louis Cottrell on clarinet and tenor sax, Lloyd Glenn on piano, Ferdinand Dejan on guitar, James Johnson on string bass, and Albert Martin on drums. The “big” sound of Albert’s “Rockin’ and Swingin'” exemplifies that of Texas jazz in the 1930s (compare to Boots and his Buddies’ “Rose Room”). 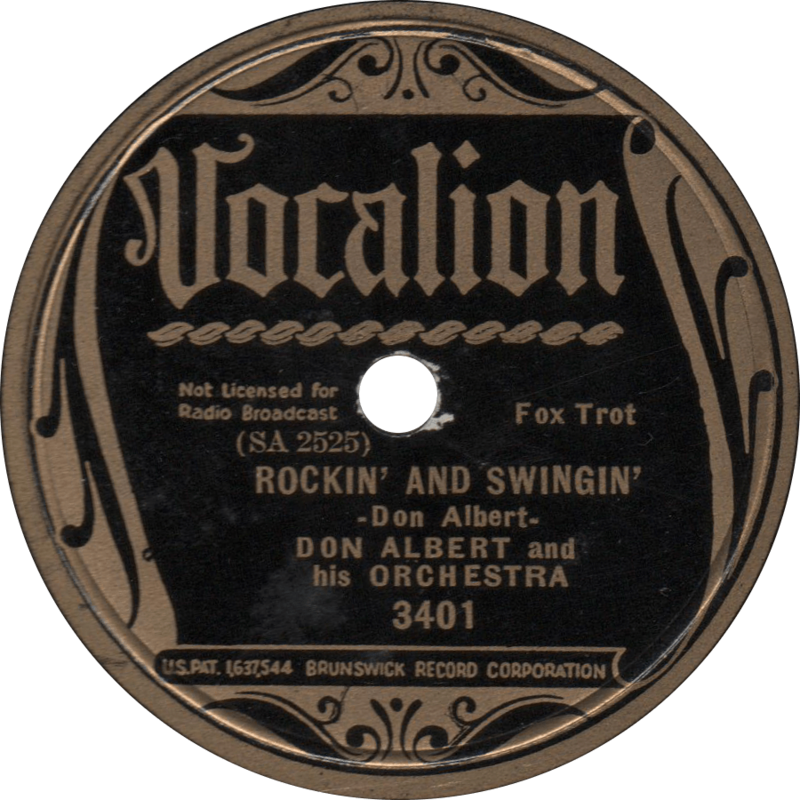 Rockin’ and Swingin’, recorded November 18, 1936 by Don Albert and his Orchestra. On the other side, Merle Turner sings the vocal on this band’s swinging version of the seven year old (at the time of recording, that is) popular song from The Dance of Life, “True Blue Lou”. 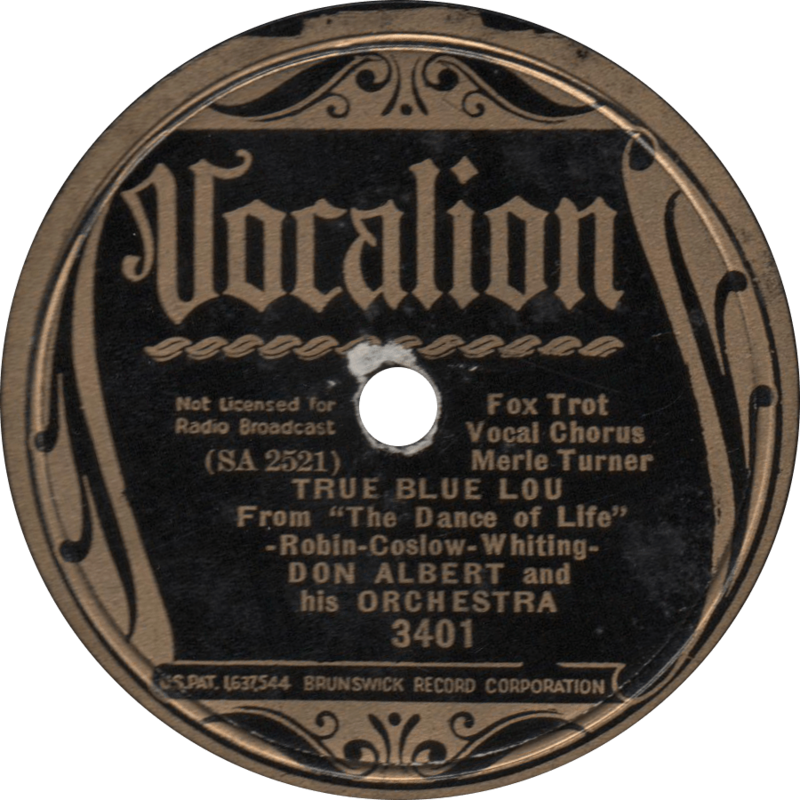 True Blue Lou, recorded November 18, 1936 by Don Albert and his Orchestra. On December 11th in 1936, King Edward VIII abdicated the throne to marry the American Wallis Simpson, becoming the Duke of Windsor. After revealing his plans to marry Simpson to British Prime Minister Stanley Baldwin, his cabinet informed him that the people would not tolerate the divorced woman as queen, as remarriage was opposed by the Church of England. King Edward was faced with three options: to dump Wallis, to go against the wishes of the British government, or to abdicate the throne. Unwilling to give up his fiancée, Edward chose to abdicate. He signed the papers on December 10, and on the evening of December 11, 1936, King Edward VIII, in a speech broadcast around the world via radio, formally abdicated the throne of England, and his brother, George VI became king thereafter. After the change, George granted Edward the title of “Duke of Windsor”. George would be the king that would see England into World War II. 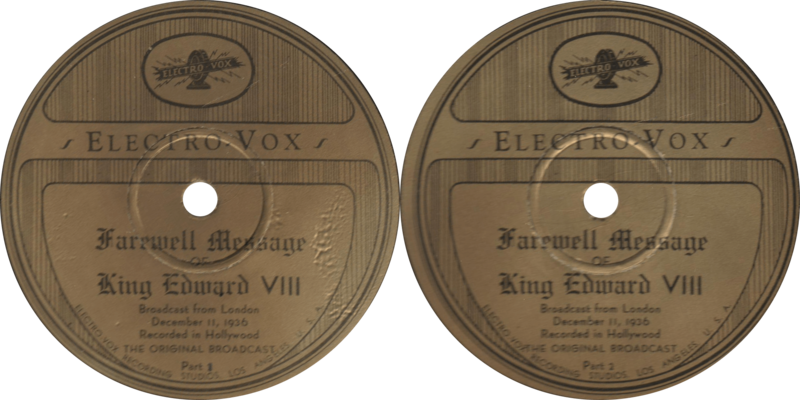 This unnumbered Electro-Vox record was recorded December 11, 1936 in Los Angeles, California from the live radio broadcast of King Edward VIII’s abdication speech in London. This speech was also issued on a variety of other labels, including Brunswick and Columbia. Many of those other issues were on standard sized ten-inch records; this one is a twelve-inch. Besides the speech, one highlight of this recording is a chance to hear the tolling of Big Ben, all the way back in ’36. Farewell Message, recorded December 11, 1936 by King Edward VIII. On this day, October 15, in 1906, blues singer Victoria Spivey was born into a musical family in Houston, Texas. Her father was a railroad flagman and singer, and her brother and sister also sang professionally. She began a successful recording career in 1926 with “Black Snake Blues” on Okeh Records, and made a film appearance in King Vidor’s Hallelujah in 1929. Victoria Spivey continued to have a successful career in music throughout the 1930s and well into the 1960s until her death in 1976. Remarkably, Vocalion 03405 was also recorded on this day, October 15 in 1936, Spivey’s thirtieth birthday, at Vocalion’s Chicago studio. Although different sources offer different personnel listings for Spivey’s accompaniment on this record appears to consist of the outstanding lineup of Lee Collins on trumpet, Arnett Nelson on clarinet, J. Harry “Mr. Freddy” Shayne on piano, and John Lindsay on string bass. “Hollywood Stomp” is an excellent upbeat jazz song with a fine hot backing that harkens back to the times that preceded the swing era. 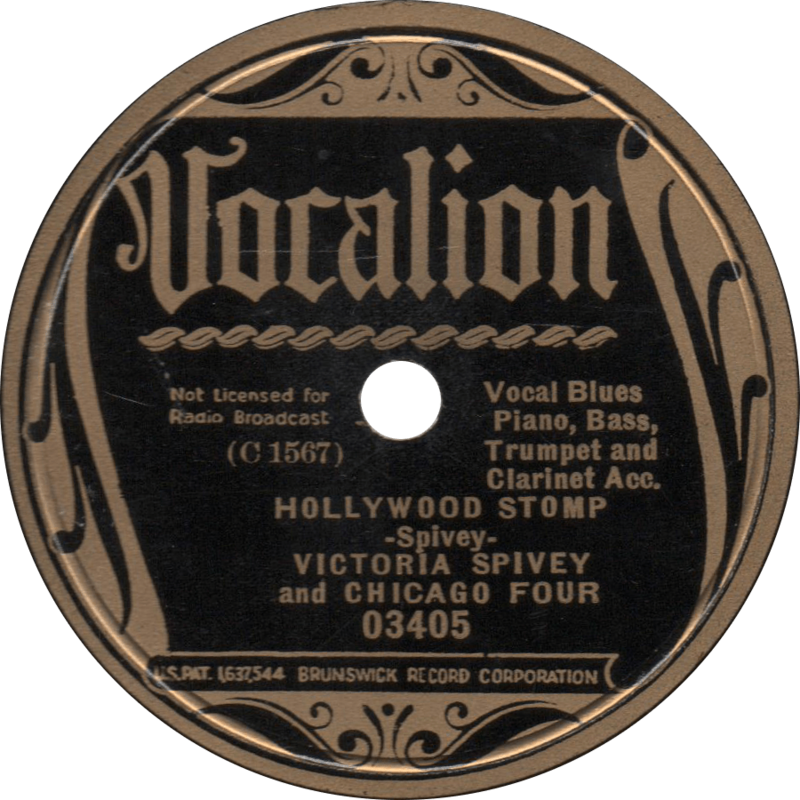 Hollywood Stomp, recorded October 15, 1936 by Victoria Spivey and Chicago Four. “Detroit Moan” is one of my personal favorites of the female blues genre, and features excellent performances by the backing musicians, not to mention Miss Spivey’s singing. 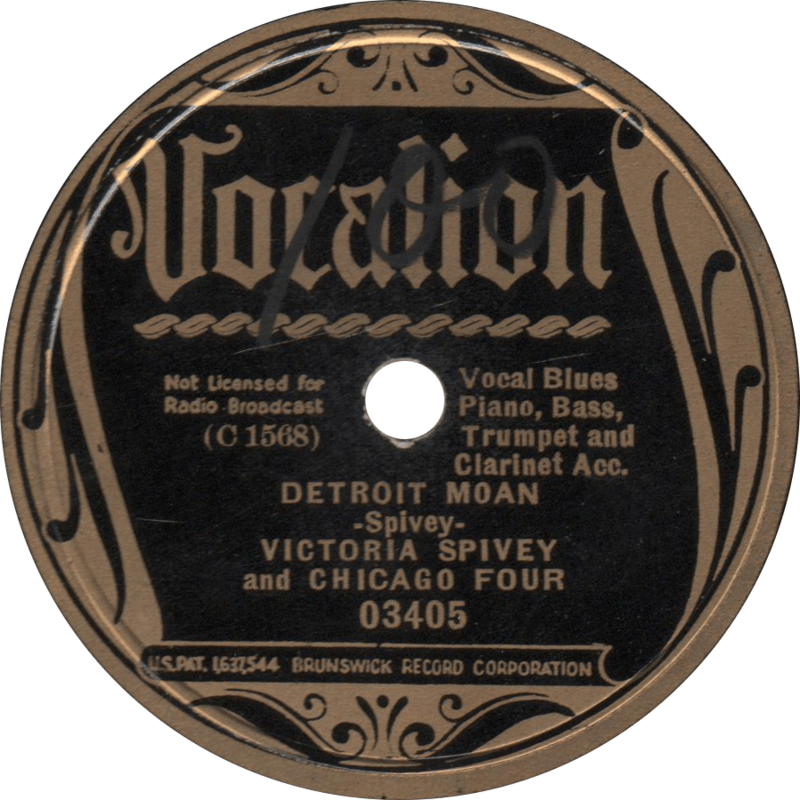 Detroit Moan, recorded October 15, 1936 by Victoria Spivey and Chicago Four. Updated with improved audio on November 16, 2016. She runs a Buick, and she hums like a Stutz. Watch that Chevy strut her stuff.